About us | Vydrus s.r.o. The VYDRUS company was set up in July 1991. Since its founding the company has been providing recycling services and also is collecting batteries, which are then supplied to final processor for reprocessing. In 1998 we started to import and sell secondhand towing vehicles and trucks according to customer wishes. We provide the after-sales service. In the same year we started to process and manufacture products from natural stone. We successfully launched our paving stones, tiles, work surfaces, windowsills etc. on the Czech market. Now we are ready to meet even the most demanding specialist requirements from customers. For this reason we built a new workshop with the storage of spare parts and new premises for processing the natural stone (marble, sandstone, granite). The plants are equipped with state-of-the-art machines and the manufacturing is supervised by experienced professionals. The company also deals in road transport. 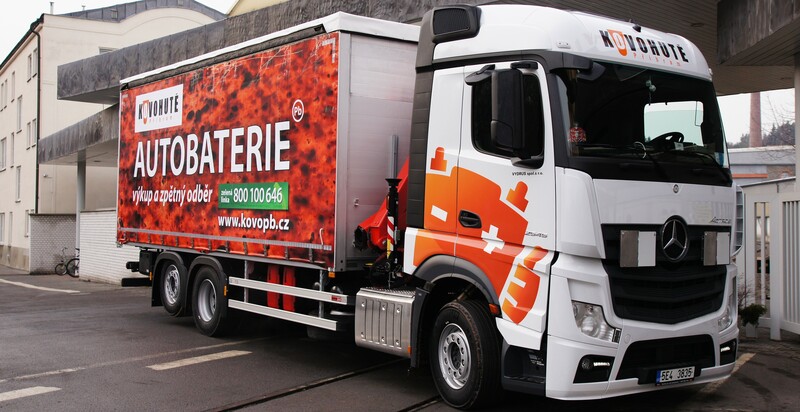 As the only such company in the Czech Republic - VYDRUS Ltd. is equipped with bulk stainless steel containers for accumulators / batteries transport. The company also provides tipping lorries and special vehicles for loading and disposal of metal waste.